(TibetanReview.net, Mar21’19) – Tourism is particularly vital, along with mining and hydropower industries, for China to recoup its massive investments in Tibet. 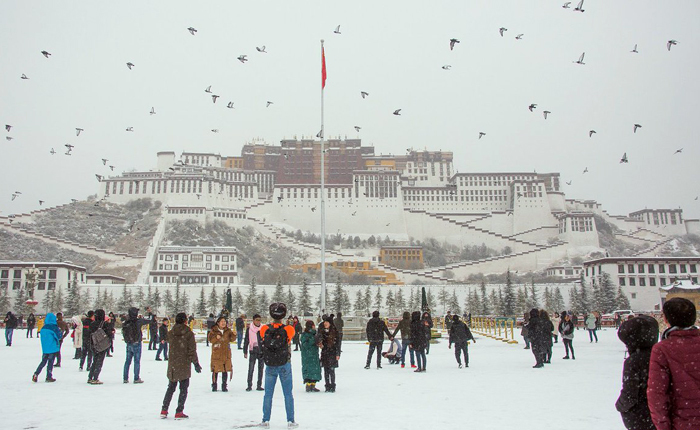 Thanks to its winter tourism promotional efforts, Tibet Autonomous Region saw 2.46 million tourists last winter, up 84.2 per cent year-on-year, reported the official Xinhua news Agency Mar 19. The overwhelming number of tourists visiting Tibet are mainland Chinese and is especially so during the winter months. The report cited the regional tourism development department as saying the region’s tourism industry brought in around 2.62 billion yuan (about US$ 390.2 million) from Nov 1 last year to Mar 15, a year-on-year growth of 41.1 per cent. The report said that in a bid to attract more tourists during the winter, the regional government had rolled out a spate of preferential policies including waiving admission charges for some scenic spots and discounted flight tickets during the winter season. This policy will continue in future winter seasons, the official chinadaily.com.cn Mar 20 cited local authorities as saying.